Bluetooth technology has becomes one of the famous short range wireless communication protocol between devices for data and audio transfer especially in PC and mobile market. 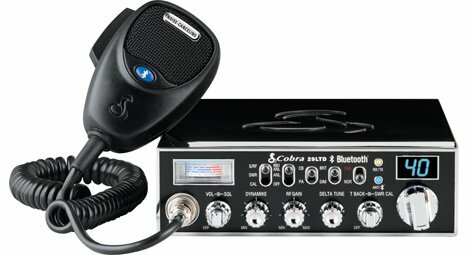 While some of you may still wondering why it was not being implemented on 2-way radios, Cobra Electronics has moved a step ahead by unveiling a new Bluetooth-enabled CB radio for consumer market. Codenamed as 29 LTD BT, it is the first CB radio enhanced with Bluetooth technology in the world. Similar to any Bluetooth devices, the CB radio is capable of pairing with any other Bluetooth-enabled devices for communication to take place. Just imagine that the CB will be able to synchronize with your cell phone (in close range) to route the audio through the wireless Bluetooth link setup between the radio and cell phone. In this scenario, it allows a more effective usage of single device to handle different group of communication without switching between each other while driving on the road. Besides, it is equipped with advanced noise canceling potato microphone to filter off the noise coupling along the audio path thus promoting better audio quality. The radio will be showcased in upcoming Mid-America Trucking show and eventually be released to commercial market this summer at a retail price of $189.95.